What a tremendous weekend it was listening to the Lord’s Prophet, Thomas S. Monson. I am so grateful that we have a living Prophet to speak for God in this day and age. We are not left to figure out this “lone and dreary world” by ourselves. We have been given revelation through a righteous servant of God and He gives us direction so that we will not be deceived or led away from the straight and narrow in this dark world. 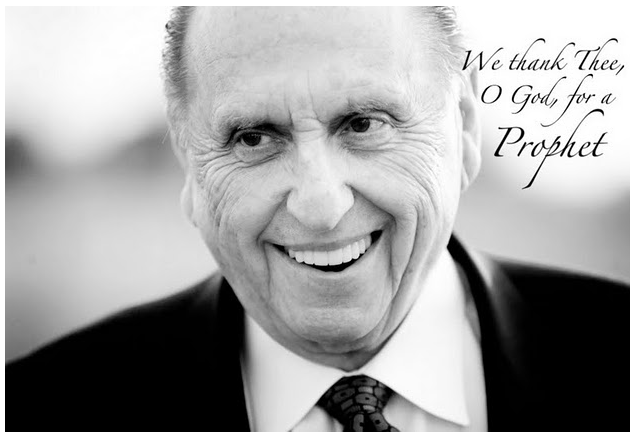 Here are the words to Hymn # 19, “We Thank Thee O God for a Prophet”, and these words sum up all of my feelings of President Monson. I love to sing this song as I watch him on TV and I feel the Spirit witness to me every time that he is God’s prophet in these the last days. This week was no exception.